This USB-C adapter helps you transmit digital audio and 4K video from your tablet, laptop, Chromebook, MacBook, smartphone or PC to an HDMI-enabled television, monitor or projector. It's an ideal tool for giving video presentations in conference rooms and classrooms, editing multiple documents on a larger screen, or streaming video for digital signage in crystal-clear 4K. By connecting the attached USB-C cable to a source device that supports USB DisplayPort Alt Mode, you can output 4K video and digital audio to a compatible monitor, television or projector without installing special software drivers. 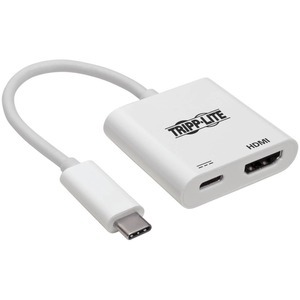 To send digital audio and Ultra High Definition video to a 4K-ready HDMI television, projector or monitor, connect the HDMI port to the display using an HDMI cable (such as Tripp Lite's P568-Series cables, sold separately). The USB to HDMI 4K adapter supports video resolutions up to 3840 x 2160 (4K x 2K) at 60 Hz, as well as 24-bit Deep Color (8 bits per channel), HDCP 2.2 and HDMI 2.0a compatibility, and 7.1-channel surround sound. It's backward compatible with 1080p displays, allowing you to use it with older equipment. The USB Type-C adapter supports USB 3.1 Gen 1 data transfer rates up to 5 Gbps, which is 10 times faster than USB 2.0. The USB-C Power Delivery 3.0 port also provides power output up to 3 amps (60 watts), which is more than sufficient for charging and powering the connected source device, such as a MacBook or Chromebook. The USB 3.1 Type-C adapter is backward compatible with previous USB generations, allowing you to use it with older USB 3.0, USB 2.0 or USB 1.1 equipment.